James Boyd, a successful steel and railroad magnate from Harrisburg, PA, begins the story of our modern Weymouth Center for the Arts & Humanities when he came to Southern Pines, NC, around the turn of the century in search of a winter estate. This estate would eventually become Weymouth, so named because it reminded him of Weymouth, England. James Boyd brought with him his wife, Louisa Yeomans Boyd. Louisa Yeomans Boyd already had a kinsman in the Southern Pines area. 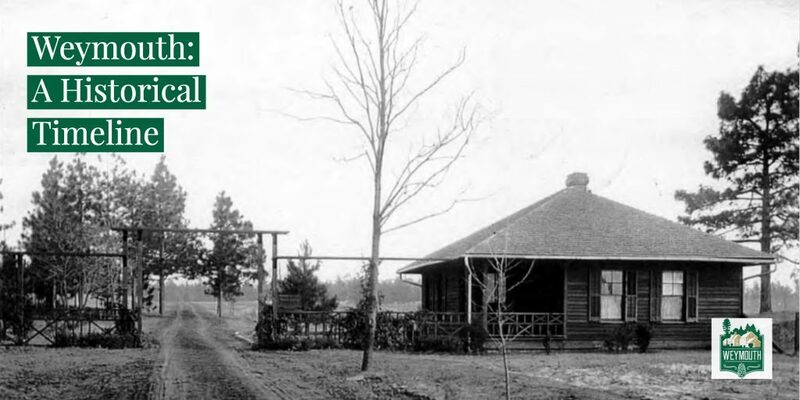 James Maclin Brodnax had moved his own family to Southern Pines, and in a deed dated 2 February 1903, James Brodnax purchased an 8.4-acre tract of land above what is now eastern Southern Pines. On that land, James Brodnax built a sizable two-story Colonial Revival style weatherboarded frame house. According to Young Southern Pines historian Helen Huttenhauer, James Boyd originally approached James Tuft, the founder of Pinehurst, who turned down Boyd’s request to purchase land. James Boyd turned instead to James Brodnax who helped negotiate the purchase of 765 acres from Archibald Blue in a deed signed on 23 January 1904. This arc of land extended from today’s Illinois Avenue to and across Young’s Road to the two-story Blue family seat. This tract of land adjoined Brodnax’s land as well. This deal ensures the preservation of one of the finest bodies of the original pine timber in the vicinity… the mere preservation of the beautiful forest is a matter of inestimable gain to everybody… The forests about Southern Pines constitute the life and future of the place. James Maclin Brodnax died in 1904, leaving behind his wife, Elizabeth Yeomans Brodnax–a niece of Louisa Yeomans Boyd, and their three children. In September 1904, Elizabeth sold Brodnax House to James Boyd and returned to her familial home in New Jersey. This house, the Brodnax-Boyd home, would become the main block of the expanded residence we now know as Weymouth and the winter residence of the Boyds until 1921. In 1906, James Boyd purchased three adjacent tracts of land belonging to the Buchan and Shaw families. These included 517 acres on James’ Creek including the residence of the late Duncan R. Shaw, 223 acres known as “Buchan dower land,” and the Big Branch 50 Acres. In total, the Boyd estate reached 819.90 acres at this point. James Boyd continued to buy smaller parcels of land adjacent to his own. At its largest, the estate reached 1,570 acres and was the largest privately held winter estate in Southern Pines and Moore County. During his lifetime, James Boyd’s estate was never officially surveyed. It was only five and a half years after his death, in 1916, that Francis Deaton, a trained civil engineer undertook the first survey. The results of this survey can be viewed in more detail as part of the Weymouth Cultural Landscape Report. …the work that is being done is but a restoration, a going back to the state of nature, a repair of the ravages of the elements. Bridle paths and carriage paths were laid out, and local residents were allowed to treat the Boyd estate as a natural park. The story of Weymouth begins with James Boyd, a steel and railroad magnate from Harrisburg, Pennsylvania. The first James Boyd, a steel and railroad magnate, came to Southern Pines around the turn of the century with plans for a winter estate. He purchased twelve hundred acres and created an estate that included stables, tennis courts, gardens and a nine-hole golf course. He named it “Weymouth” because it reminded him of Weymouth in England. His grandsons, James and Jackson, were frequent visitors. Since they were very fond of fox hunting, they founded the Moore County Hounds in 1914. After World War I, they divided the original home of their grandfather. In 1913, the Boyd’s asked their friend and former Princetonian Aymar Embury II, a renowned New York architect and the official architect for Princeton University, to build their house. He also designed many residences and buildings in this area, including Mid Pines Resort, Market Square in Pinehurst and several buildings on Northwest Broad Street in Southern Pines. James and his wife Katharine Lamont Boyd lived in the gatehouse until their home was completed. It was there that he wrote and Katharine typed the manuscript for his first and most famous novel, Drums, which was published in 1925. A deluxe 1928 edition was illustrated by the famous artist N. C. Wyeth. The Boyds entertained extensively and Weymouth became the center of a very lively social life in the 1920s and 1930s, with literary friends such as F. Scott Fitzgerald, Thomas Wolfe, Paul Green and Sherwood Anderson. Boyd became one of America’s outstanding authors of historical novels. Drums was followed by Marching On (1927), Long Hunt (1930), Roll River (1935) and Bitter Creek (1939). He also wrote poetry and short stories. The Boyds were active in the community, supporting Moore County Hospital (now First Health) and the Southern Pines Library. They donated the property to establish Penick Village. In 1941, James Boyd purchased the local newspaper and became editor of The Pilot, and when James died in 1944, Katharine assumed management until 1969 when it was sold to Sam Ragan, a well-known North Carolina journalist and poet laureate of NC. In 1963, Katharine Boyd gave a wooded tract to the state of North Carolina which became the Weymouth Woods Nature Preserve. When Katharine died in 1974, Weymouth was left to the Sandhills Community College. James and Katharine are buried in Bethesda Cemetery near Aberdeen. They had three children: James, Jr., Daniel, and Nancy. The Friends of Weymouth was chartered as a nonprofit corporation in 1977 and purchased the home and grounds in 1979 to establish a cultural center. The Boyd House and remaining acreage is listed in the National Register of Historic Places and was awarded a certificate of achievement by the National Wildlife Federation in 2003.